The Avro Lancaster formed the backbone of RAF Bomber Command and was considered by many as the best bomber aircraft of WWII. 630 Squadron formed at East Kirkby in November 1943 as part of Bomber Command’s strategic bombing campaign. Equipped with Lancasters, they often flew together with 57 Squadron from their shared Lincolnshire base to take part in many major bombing raids including those on Berlin and Hitler’s alpine home at Berchtesgaden. This superb new piece from Richard is yet another example of why he is regarded as one of the best pencil artists in the industry. 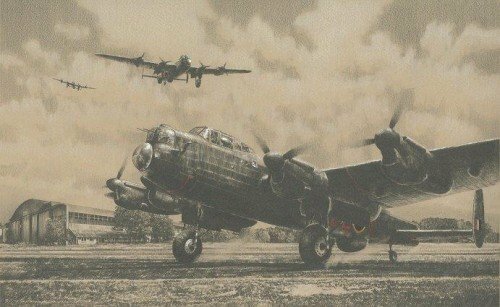 Completed in his trademark technique with a mixture of graphite with colour highlights on antique buff paper, this stunning collectors piece depicts Lancasters of 630 and 57 Squadron's making a safe return to RAF East Kirkby after another gruelling mission to Germany in 1944. Flight Sergeant LEN MANNING Serving as a Rear Gunner on Lancasters with 57 Sqn, his aircraft was shot down by a German Night Fighter on his 3rd Operation on the night of 18/19th July 1944. After baling out he was taken in by French civilians in the town of La Trétoire who treated his wounds and helped him evade capture until the Allied advance reached northern France. Still suffering from his injuries, he returned to Britain in early September 1944. THE REMARQUE EDITIONS Few artists of today possess Richard Taylor’s breathtaking skills with a pencil but now the artist has lifted the bar even further. Richard has without doubt taken the art of graphite creation to an entirely new level by introducing subtle coloured highlights into his pencil work. Collectors now have a wonderful opportunity to acquire one of these remarkable 'colour' remarques. Each print in the remarque editions will have an original pencil drawing, hand-crafted to order by the artist in the lower margin below the image. With just FIFTEEN Single Remarques and TEN Double Remarques issued we expect this edition to be in high demand.